Product #32475 | SKU LKBU-FCPX10-M89-US | 0.0 (no ratings yet) Thanks for your rating! The Pro Line Final Cut Pro X Ultra-Thin Aluminium Keyboard from Logic Keyboard is based on the original Ultra Thin Aluminium Apple Pro keyboard. It offers plug & play setup with any current or recent USB-equipped Mac computers as well as a stylish and modern design to match the new Apple look. This keyboard is specifically made for Apple Final Cut Pro X. 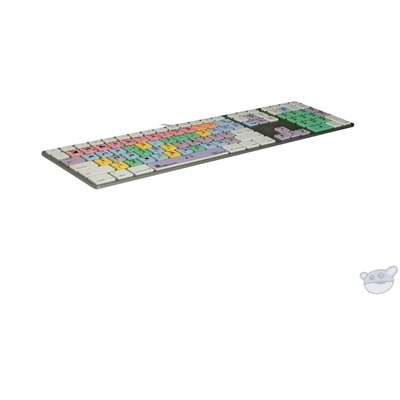 It is ideal for post-production facilities, professional video editing houses and anyone else who requires all the custom key commands to readily accessible from a dedicated, clearly labelled, colour-coded keyboard. This keyboard is also a great way for a novice to learn the Apple Final Cut Pro X key commands. All custom keys are fully coloured and replace their original white counterparts. Since this keyboard also features all the regular letter, symbol and number labels that you will find on a conventional keyboard, it can either be added to your computer in conjunction with your conventional keyboard or simply be used as a substitute for it. This is a Pro Line keyboard, so it features fully dyed-in coloured keys.